The reason the rest of the world thinks we’re nuts. 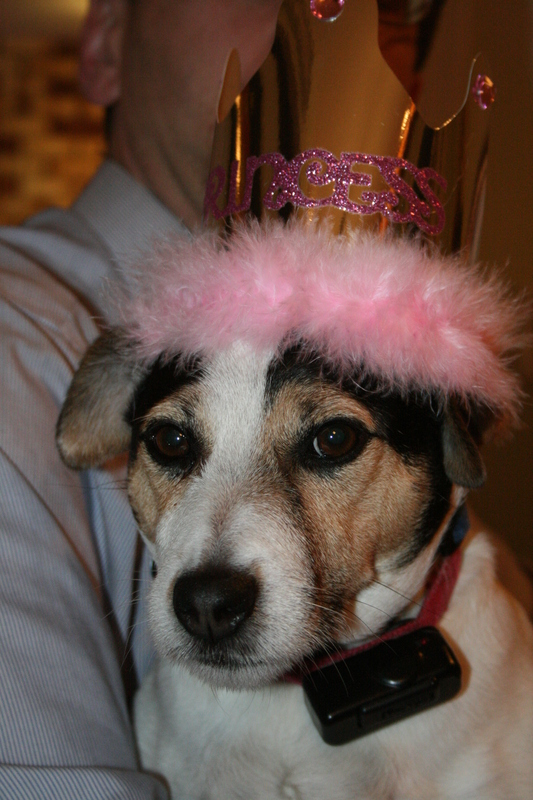 Our little Taffy, canine extraordinaire, was four years old yesterday. Being a family unlikely and unwilling to skip cake a party, we couldn't let the day pass without marking it. Okay, I couldn't let it pass. While I was at work the kids asked Paul to run out and buy her a cake. His reaction was less than enthusiastic. In fact, I heard it was something like, "YOU HAVE GOT TO BE KIDDING ME." Because I have extra-sensory perception, and knew the kids wouldn't forget what day it was and were likely clamoring for a party, I picked up these adorable cupcakes at Target on the way home from work. Does it get any cuter than this? Because if it does, I haven't seen it. And if I do see it, I'll buy it. And her gift? Beef & Cheddar Flavor Snaw Somes! 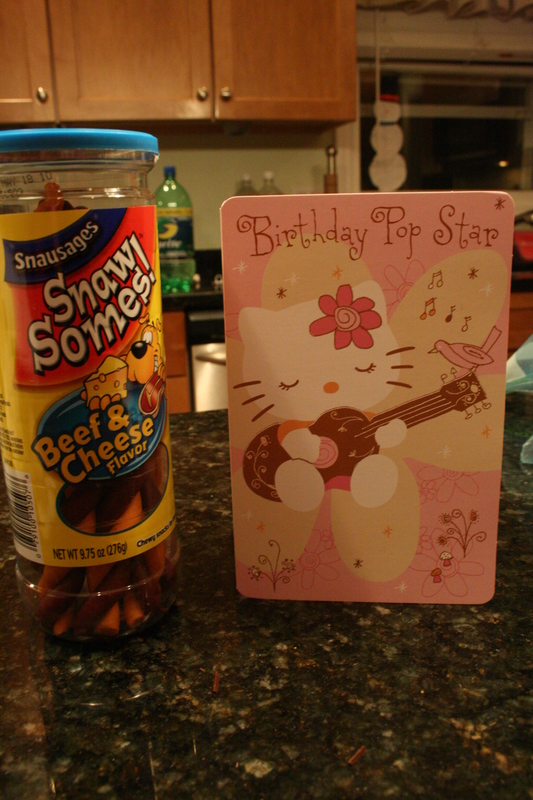 Nothing says fourth birthday like artificial snausage treats. That's what I always say. I warned the kids not to give either dog a full snausage as a treat – at least not at one time. Not if we'd like to continue to breathe the air after they digest them. Because hoo-boy. I can just imagine. With two dogs it gets bad enough in here without chewy faux meat products. How adorable! 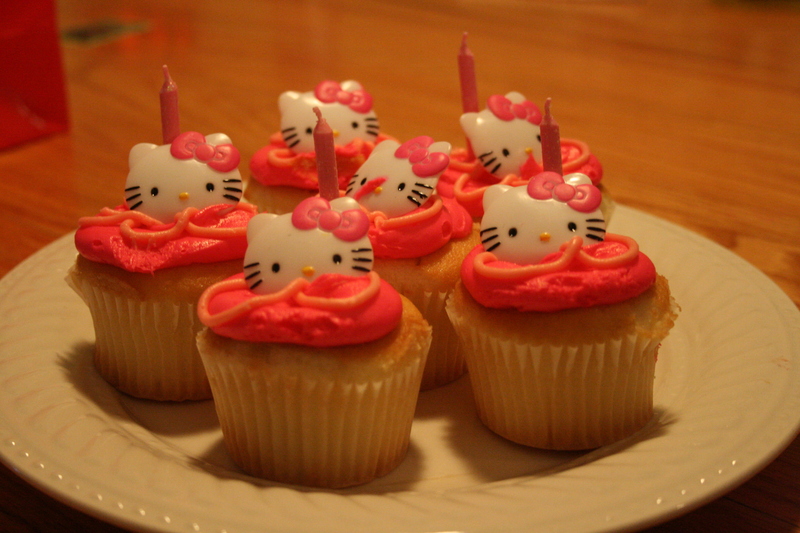 Hello Kitty cupcakes! I wish I was that spoiled on my birthday.. lucky dog! Previous Post Authenticity, equality, and hope. Next Post On the cusp of spring.